For the first time in franchise history, the Jazz began the season with the same starting lineup that they used in the previous season’s opener. It didn’t go well. After a preseason finale in which the Jazz got out to a 47-12 run against the Kings, this time, it was Sacramento who jumped all over Utah early, to the tune of a 25-9 lead after six minutes. Adjustments were made quickly, and unlike last Thursday’s contest, the team that was down fought back, to the tune of a 123-117 win over the Kings. In fact, the Jazz did so quickly, thanks to the insertion of backup guard tandem Dante Exum and Alec Burks. Both players showed off their remade skillsets, making their 3-point shots and making the right read in pick and roll situations. Going to a smaller lineup also helped open up the space for those players to succeed. In the end, the Jazz cut the lead to four by the end of the first. By the second quarter, the Jazz’s offense was rolling again. Joe Ingles caught fire, scoring 17 first-half points thanks to 3-of-3 3-point shooting and crafty finishing around the rim. The end result was a 68-55 halftime lead that made it seem like nothing had ever gone wrong. But just as they did in the first half, the starters again scuffled to begin the second half, even losing the lead. Snyder, having learned from what had happened an hour earlier, put Exum and Crowder in quickly, just three minutes into the third quarter. Again, the Exum-led small lineups had more success, and he ended up finishing the game, playing 27 minutes. It wasn’t a shining first game back for Ricky Rubio, who struggled with many of the same things he did in his sketchy start to his 2017-18 campaign. He missed layups, lobbed Rudy Gobert with passes that were even too high for the lanky Frenchman, and tried to draw fouls that ended up just looking like ugly plays. In the end, Rubio finished with only 1 point, plus just four assists, and a team-worst -16 plus-minus. Donovan Mitchell started slowly, but ended up finding his game late. Despite his calm demeanor before the game, he forced some iffy looks and wild drives. But despite that, he ended up as the Jazz’s leading scorer with 24 points on 8-21 shooting. That being said, he wasn’t the Jazz’s best player of the game: that title belonged to Ingles who had 22 points on only 12 shots, plus a team-high six assists. Defensively, the Jazz weren’t anywhere near their usual standard. They allowed 110 points per 100 possessions to the Kings, and gave a lot of easy baskets to Willie Cauley-Stein, Nemanja Bjelica, and others. 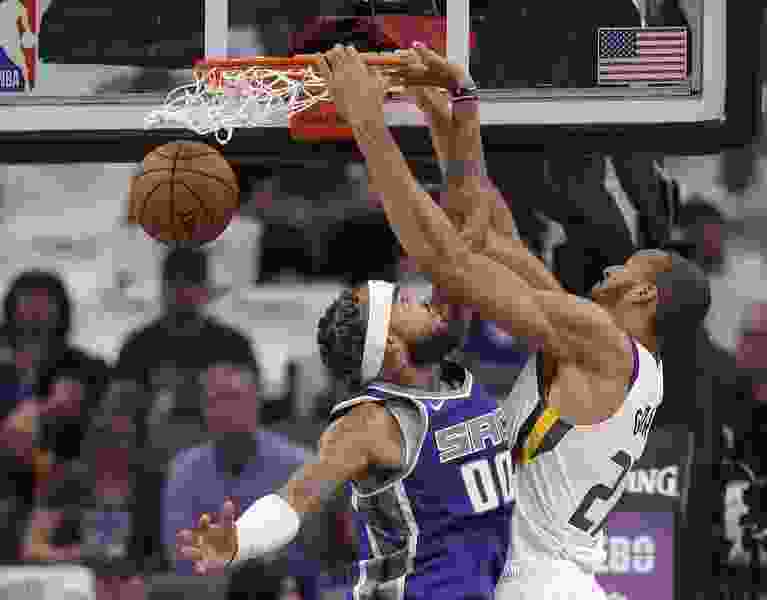 Gobert did finish with 19 points and 15 rebounds, but the Defensive Player of the Year wouldn’t have earned the same award for his defensive play in Game 1 of 82. But while it may have not been in their traditional manner, the Jazz’s familiar cast of characters pulled out a win. And Snyder is happy about that, if not the overall performance. “It’s a group that I really like, so I’m glad they’re back,” Snyder said.